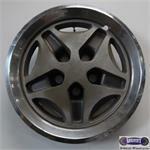 108, Hubcap used, 14", 68, AMC, AMX, JAVELIN, 5 SPOKE TYPE. 113, HUBCAP USED, 14", 69, AMC, AMX, JAVELIN, 5 SPOKE TYPE. 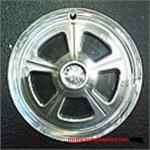 116, Hubcap used, 14", 70-73, AMC, AMX, GREMLIN, JAVELIN, 5 SPOKE TYPE. 1320a, Used Rims, 15X7-1/2, 5 LUG 4-3/4", 83-94 CHEVY, GMC, 4X4, BLAZER S10, JIMMY S-15, 5 SPOKE, GRAY TRIM, ALLOY. 1382a, Used Rims, 14X5-1/2, 5 LUG, 100 MM, 84-89, OLDS, CUTLASS, CIERA, SUPER STOCK, 5 SPOKE, STEEL. COLOR MAROON. MAY COME IN SEVERAL COLORS. 1455c, REAR Used Rims, 16X8, 5 LUG, 4-3/4, 85-87, CHEVY, CAMARO, MACHINED WITH SPARKLE RED POCKETS, 5 SPOKE, INDENT IN EACH SPOKE, ALLOY. 1455c, REAR Used Rims, 16X8, 5 LUG, 4-3/4, 85-87, CHEVY, CAMARO, MACHINED WITH SPARKLE RED POCKETS, 5 SPOKE, INDENT IN EACH SPOKE, ALLOY. A= ARGENT B=GOLD. C=SPARKLE RED, D=GREY. 1607a, CENTER CAP USED, 87-92, CHEVY, CAMARO, PAINTED GRAY, MACHINED CENTER, CAMARO LETTER IN CENTER, 5 SPOKE, 5 METAL CLIPS. 3-1/2" DIA. 1607a, CENTER CAP USED, 87-92, CHEVY, CAMARO, PAINTED GRAY WITH MACHINED CENTER & CAMARO LETTER IN CENTER. 5 SPOKE AND 5 METAL CLIPS. 3-1/2" DIA. FOR A 15" RIM, ALSO FITS 1276. 1607b-1, CENTER CAP COPY, 87-92, CHEVY, CAMARO, BLACK PLASTIC, CHROME RING, BLACK CENTER, 3-1/2" DIA. 1607c, CENTER CAP COPY, 87-92, CHEVY, CAMARO, BLACK PLASTIC, CHROME LEAF, BLACK CENTER. 5 SPOKE, 5 PLASTIC CLIPS. 3-1/2" DIA. 1607c, CENTER CAP COPY, 87-92, CHEVY, CAMARO, BLACK PLASTIC WITH CHROME LEAF AROUND BLACK CENTER. 5 SPOKE AND 5 PLASTIC CLIPS. 3-1/2" DIA. FOR A 15", RIM, ALSO FITS 1276. 1659, Used Rims1659, Used Rims, 16x6-1/2, 5 LUG, 115mm, 89-91, Pontiac, Grand Prix, 5 SPOKE, ALLOY. 1659, Used Rims, 16x6-1/2, 5 LUG, 115mm, 89-91, Pontiac, Grand Prix, 5 SPOKE, ALLOY. 1682, Used Rims, 16x7, 5 LUG, 4-14", 89-92, Ford, Thunderbird, 39mm OFFSET, 5 SPOKE, ALLOY. 1682, Used Rims, 16x7, 5 LUG, 4-1/4", '89-'92, FORD THUNDERBIRD, 39mm OFFSET, 5 SPOKE, ALLOY. 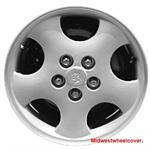 2055a Used Rims, 16X6, 5 LUG, 4-1/2", 95-97, DODGE, AVENGER,SILVER PAINTED, 5 SPOKE, ALLOY. B=WHITE. 2080a, Used Rims, 17X6-1/2, 5 LUG, 100MM, 97-00, Dodge, Avenger, SILVER OFF SET STAR SHAPE, 5 SPOKE ALUM RIM, MACHINED OUTER LIP, A=SILVER B=WHITE. 2099a, Used Rims, 16X6-1/2, 5 LUG, 100mm, 97-00, CHRYSLER, SEBRING (CONV), BRUSHED FINISH, 5 SPOKE WITH DIMPLE IN EACH SPOKE, W/GOLD ACCENTS, ALLOY. 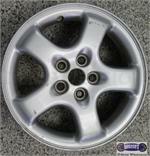 2101a, Used Rims, 14X6, 5 LUG, 100mm, 98-99, DODGE, NEON, 5 SPOKE, SILVER, ALLOY. 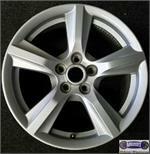 2109, Used Rims, 17x6-1/2, 5 LUG, 4-1/2", 99-00, Dodge, Caravan, SILVER, 5 SPOKE, ALLOY. 2114, Used Rims, 15X6, 5 LUG, 100mm, 99-00, DODGE, STRATUS, SILVER, 5 SPOKE, ALLOY.